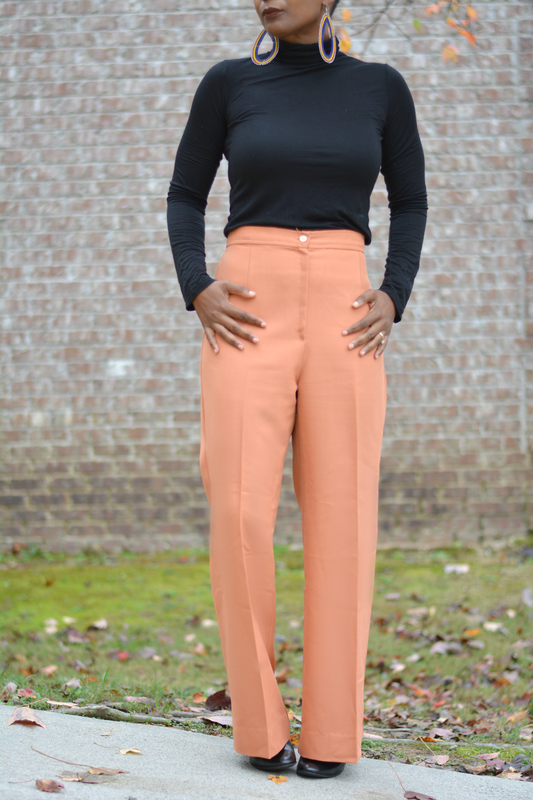 I was about ten pounds heavier when I last wore these vintage flared pants. I bought them during my weight loss transition. They were sorta big then and now they're real droopy in the crotch and instead of donating, I decided to take in the waist. This is my first time altering a waistline. Sometimes DIYs don't work out but I wasn't afraid to experiment. The pants were made about forty years ago in someone's sewing room using a cheap polyester. It's no big deal if I muck it up. The alteration is not a super complicated diy but if you have an expensive piece, I'd leave it to a professional tailor to keep it nice and clean looking on the inside. My pants now fit and the stitch is solid but the inside looks all the way janky. You don't want that for your fancier duds. I would normally just hand these back to the thrift store but I'm a big fan of orange clothes and super high waistbands. Therefore, I'm making it work. Instructions: 1. 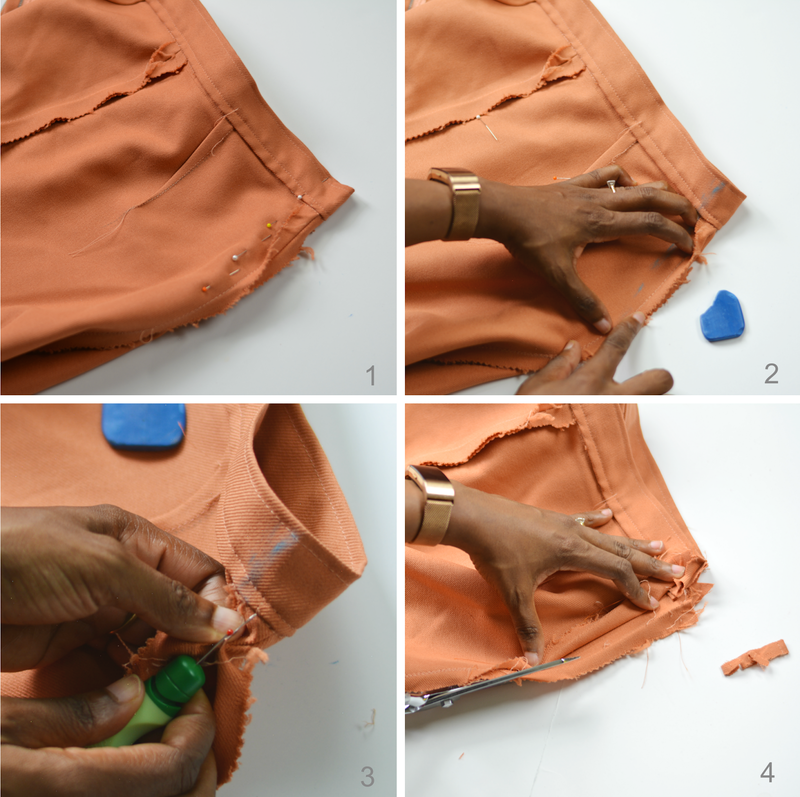 Try the pants on inside out and pin the pants in back at the center seam until you get the desired fit. You may need a little help with this to avoid pin pricks. 2. Carefully remove the pants. Trace a stitch line along the pins making sure the line tapers to meet stitch line of pants. 3. Rip out the seam where you will be making the adjustment. 4. Sew along marking until you reach the original seam. 4. Cut away excess fabric and finish to remove bulk. I wore it with a simple black turtleneck and black boots. I normally have an irrational thing about wearing orange and black. My mind always goes to Halloween costume. It's dumb but it is what it is. The peachy color doesn't give off the pumpkin vibe so I was able to work through that issue. I like the black and orange palette better than the blue denim I went with last year though. Within a few hours of wearing, Mr. Cuddles (our new pup) saw the sway of the bell bottoms and latched his pointy little fangs into them and tore a hole in the pant leg. 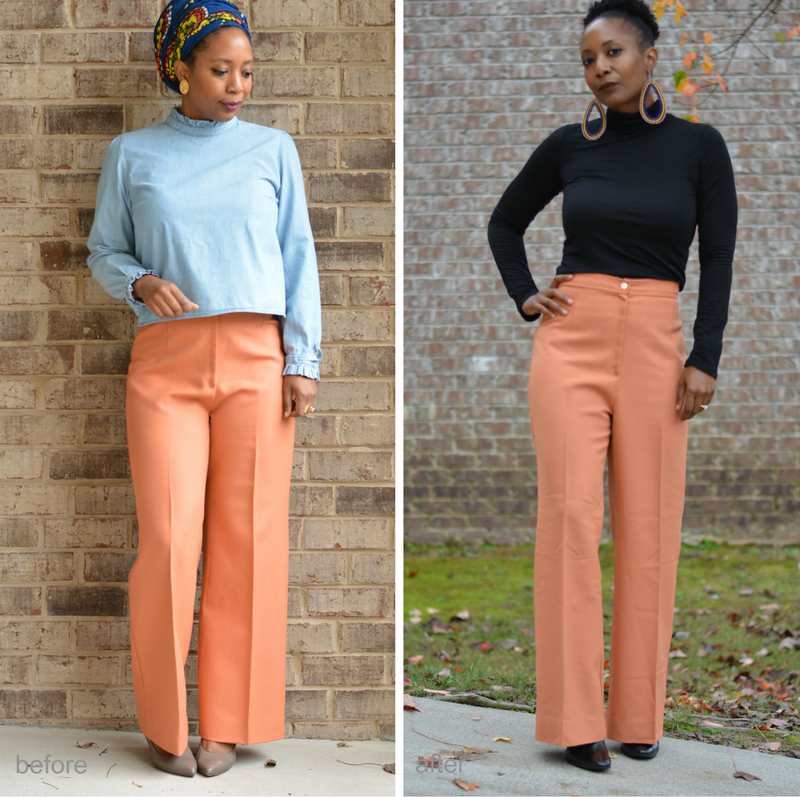 I guess they'll be culottes real soon!